Lady Mary Crawley and me – Fancy Nancy says…. nancynywoman January 19, 2014 Happiness Now. I never thought I would see the day when I have something in common with a member of the British aristocracy. 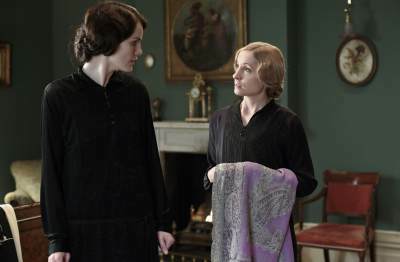 The PBS hit series, Downton Abbey season 3 finale changed all that for me. SPOILER ALERT IF YOU HAVE NEVER WATCHED STOP HERE. Last season when Lady Mary Crawley’s (Michelle Dockery) beloved (handsome, charming) husband Matthew Crawley (Dan Stevens) was killed in a car crash just when things were going so well- -I, along with millions of other viewers was knocked off my comfy sofa and spilled my biscuits and tea. At the close of season 3 I had recently been cast in a new role in my life: Widow. I was rooting for Lady Mary and Matthew to live happily ever after so that I could live vicariously through them and cry my eyes out at what I missed and then “boom” Lady Mary becomes a widow too. I burst into tears and wailed, “Oh no, not Matthew and “oh no, I miss Mark”. Matthew is a fictional character, I cried for him like I do over Mark. Mark and I were married for 26 years and it took us under 3 years to get married. Like the Crawley’s who lived under the same roof at Downtown-before they were married, we lived together in a floor-through apartment in Park Slope before we got married. Lady Mary and Matthew had a big wedding ceremony and party at Downton-Mark and I got married in a castle- like synagogue in Park Slope built around the same time that Downtown is set in. We had an intimate family dinner on Prospect Park West then we rushed off. to Shea Stadium to the 1986 World Series to catch the end of the 7th game when the Mets beat the Boston Red Sox sharing a box with Billy Joel and Christie Brinkley and the Mets’ wives. Both Lady Mary and I wore off white instead of pure white. I had been married before and Lady Mary did have that Turkish incident that despoiled her purity so to speak. “I hear you your Lordship,” I said aloud. Tissue-box in hand. The episode had just started and I was already crying. Lady Mary is in the Widows club – the one no one wants to be in. Now, Lady Mary and I are like sisters we are in the same “hood” know as “the widow-hood”. I really feel her pain. Though she is a fictional character, in an English soap opera, younger than me, residing in the early part of the 20th century in a country estate; I know I could sit down with Lady Mary at tea-time and we would be kindred spirits. Widows “get” other widows. We know that time only ‘sort of’ heals the loss of a husband or wife. And grief is tricky there really isn’t a right way or time limit on how long you may be sad and miss the one you love. When season 4 opens for Lady Mary, only 6 months time has passed since Matthew was so abruptly ripped from her life just as they are (finally!) getting started, she is grief-stricken and mostly non-functional. At 6 months the reality of loss hit me hard: Mark is not coming back, not walking through the door again. Absurd that I thought he might. There were moments I expected him to walk into the room like when the President was re-elected. I even jumped up and called out to him. But he didn’t show up. I wasn’t sure whether to laugh at myself or cry right then so I did both. In our modern American culture 6 months is just the time some people drop away from your life. Even though you might be barely ready to crawl, someone has to take care of the day to day running of the household. Even so, this is where it is Advantage: Lady Mary. In Lady Mary’s world her family lives at Downton Abbey and others are there with great regularity. Even her desperately bereaved mother-in-law and fellow widow, Isobel Crawley (Penelope Wilton) is nearby and is ever so slowly starting to join the family again even in her sorrow and her disapproval of Lady Mary’s moving forward. In Lady Mary’s world, there is a large and organized household staff to take care of the details of her life. Lady Mary does not find herself plodding through reams of paperwork, having to do the laundry, remember to feed herself something healthy and try to get some sleep at a time of great confusion and even misery. Thankfully there is taskrabbit.com, I have hired a “rabbit” or two to come and help me with organizing tasks too difficult for me to handle alone. Lady Mary is sad and in shock. She had a life ahead of her with beloved. It is all she can do to sip tea from her breakfast tray and let her ladies maid Anna (Joanna Froggatt) dress her, “Only the black please,” and fix her hair. How many times have I said to myself, “I would love to have a ladies maid right about now, she could help me pick out the best Spanx for my outfit, zip up my dress and help me with the clasp on a necklace.” Mark used to help me with the latter two. And how about Mrs. Patmore, (Lesley Nichol) and her kitchen staff. I do not love cooking and doing the dishes without Mark. Mark was one of those rare men who liked to cook with me then do the dishes and even clean the floors with the Swiffer wet jet. I was spoiled. The great debate swirling around Lady Mary is whether it is time to get on with it. Easy to say; very hard to do. When you lose someone you love a spouse, a partner, the love of your life how do you “carry on” when all your hopes and dreams have died? Lady Mary has a beautiful son. She is lucky that she has him- a gift from her beloved Matthew that she can raise him if she chooses, to have his kindness and values. And yet she feels so sorry for herself that she calls him “poor little orphan” when in fact he has a large loving family, a fortune he is heir to and a mother who is not quite ready to step forward and love him. Lucky for her, she has a full-time nanny, except as it turns out she is a mean, nasty woman who ultimately gets the boot. A replacement will be found I am sure of this. I just hope Lady Mary doesn’t make the mistake of getting involved too early on in a relationship she is not ready for. Widows have a hard time making well thought out clear decisions, quite often unsuitable suitors do come along who may not have your best interests at heart. And it seems they will be lining up. Lady Mary is rich, young, beautiful and vulnerable and there are men out there who want to gain her affections to get their hands on her fortune. Here’ s where I have the edge: in Lady Mary’s world there are no bereavement groups, grief counselors or therapists, no yoga classes or meditation groups to help her find her way, express her grief and just be able to live into the sorrow. Just by doing all those things I can get dressed, put on my lipstick and go outside and find the joy in life. For Lady Mary her biggest ally and supporter is her grandmother, the Countess Dowager Violet (Dame Maggie Smith) and it could be her widower brother in law Tom (Allan Leech) if he would give up the idea that he doesn’t belong and count his lucky stars he got to move upstairs and join the family. I am rooting for Lady Mary to find her way, though I am pretty sure there is going to be a lot of drama along the way. There are more stories upstairs and down and you need a score-card to keep track of who is whom. So stay tuned and I will keep my tissue box handy. For a complete episode recap of Downton Abbey’s season premiere check out what my friend Diane Clehane has to say at dianeclehane.com. Posted in Happiness Now. and tagged Allen Leech, Dame Maggie Smith, Downton Abbey, Joanna Froggatt, Lesley Nichol, Michelle Dockery, Penelope Wilton, widow. Bookmark the permalink.